Are You Ready to Leeeeeeeeeeeead????!!!! Suddenly music blared and spotlights raced across the room. "Are you ready to RUMBLLLLLE?!!!" a voice boomed then introduced the starting line-up as, one by one, players in jerseys glided across the...carpet. 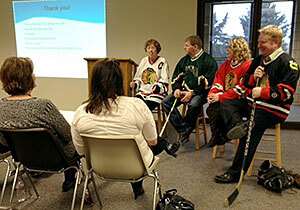 This was no hockey game, and we weren't in an ice arena, but in the community room of Barnesville's Wells Fargo Bank building. Our players? They were a team, but one made up of some of the newest members of Leadership Barnesville. It was project presentation night, and those gathered in the room were there to hear about or to present the four community projects that the Leadership Barnesville participants had been working on since they came together last September. Eighteen participants make up this year's group, which happens to be the 10th year of graduates. Just under 200 people have taken part in the program. That's a lot of leadership power in a town of just over 2,500. Some of the sessions include team building, conflict resolution, leadership styles and generational thinking. The small-team projects worked as a lab for members to apply their newly minted skills to specific community issues. This night, the four presentation groups focused on Business Development, Youth Engagement, Health and Wellness, and Parks and Recreation. 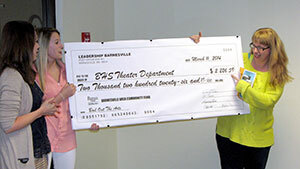 The Barnesville Area Community Fund, which is administered by West Central Initiative, gave each group $250 seed money and the opportunity for further fundraising. While these were the groups' formal presentations, many residents were already familiar with the projects. "What's exciting about this class is you've made a real difference to Barnesville," said Karen Lauer, executive director of the Barnesville Economic Development Authority and Leadership Barnesville coordinator. As part of their presentations, the participants discussed each of their learning styles as well as their stretch goals that encourage them to work outside of their comfort zones. After each presentation, a panel of community foundation board members asked questions. Our "hockey" players were actually members of the Parks & Rec group. 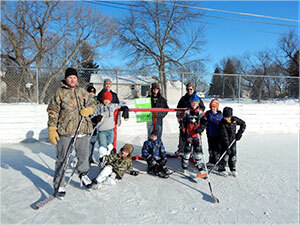 Their goal was to promote outdoor recreational ice skating and ice hockey in Barnesville. They collected and sharpened 60 pairs of donated figure and hockey skates, and built shelving in the city rink warming house to store and display them. Residents could then borrow the skates. "We saw young families who didn't want to make a huge investment [in skating equipment]. This allowed them to try out the sports," a presenter explained. The team also provided new hockey nets. The Health and Wellness group's goal was to promote overall community health. That's a pretty tall order, but the team came up with a simple and exceedingly helpful idea: they would mark out two distance routes in town, a 3.2- and a 5-mile route for running, walking and biking. The group created a map, which was added to the city website and to the Barnesville Parks & Rec brochure. They also helped develop signage that will be installed along the routes by the public works department. The Youth Engagement team decided to raise funds for youth activities. But which one? They realized that when it came to school fundraising, the arts were often overlooked. In particular, the theatre department was in dire need of new microphones. With a problem for the creative arts came a creative solution: "Bail Out the Arts." On a bitterly cold day in February, 20 high school students were "arrested" and brought to Barnesville's historic old jail museum where residents could stop by with donations to help "bail out" the prisoners. Old-timey wanted posters mixed with new-fangled social media to help promote their cause to raise $2,000. As part of the evening's presentation, the group handed an oversized check of $2,226.59 to a very enthusiastic head of the high school arts department. EDA booth at Business After HoursThe Business Development team wanted a way for residents to learn more about the businesses in town--many of which they didn't know existed prior to Leadership Barnesville, especially the home-based businesses. So they developed Business After Hours, a networking event held at the Galaxie Supper Club and Sports Bar one recent evening. Businesses were invited to set up booths to promote their products and services. Fifteen businesses took part. The team charged a fee per booth so funds would be available to continue this event into the future. City Council Member Richard Sylvester was on hand to provide some words of encouragement to the Leadership Barnesville class, as well as some advice, such as the importance of listening to residents' needs and the art of compromise. "I have learned so much this evening," he said. "I am really encouraged that I can look over all of you and know that someone will be taking my place who will be confident and will do well."